Day two of the tour brought us to Olympia, WA. We were all a little worse for wear, but a quick stop at the coffee shop and a few extra shots of espresso cured any headaches from the long night before. We took a few moments to survey this little town that seemed occupied by an abundance of police. Let’s hope for the best tonight. We made a quick stop at the Royal Lounge at 311 Capital Way N Olympia, WA and saw what appeared to be an old warehouse that has been turned into a venue. It had a dark, gothic look to it and appears to match the mood of Olympia. Let’s hope for some style inside and know that no matter what, Krizz and the guys will rock this location tonight. The show started off slow and people trailed in. The venue didn’t meet capacity, but as any artist knows whether there are two or 200 people in the audience, we still rock like there are 2,000. I had a feeling Olympia may not have more youth than those who were already in the door. The sets started out well and the bar was stacked as if hundreds of people would attend, which perked many of us up. We were ready to drink, have fun, and listen to incredible music. Tragedy 503 rocked the stage with a great set. I can see why his fan base here is growing quickly and I am happily awaiting the new CD release of Dark Side of the Womb and the new DVD release. Knothead brought the rock and had the crowd jumping and moshing. DJ Chill, official Strange Music DJ, brought a party attitude and flavor that said, “Even if the crowd’s small, my talent is big enough to fill the whole house.” He is a personal favorite of mine and I always enjoy his set. Many other artists hit the stage, and I could feel the crowd’s excitement that Krizz and Irv would be on soon. 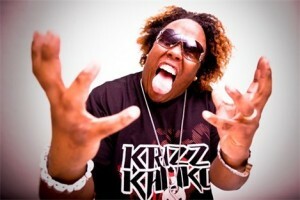 Krizz Kaliko took the stage like a lightning bolt and Irv Da Phenom like the thunder to follow. The crowd was in an uproar. The house was rocking, and the music was jumping. Everyone was happy with the set and was glad to get to be a part of that night. I personally love how Krizz always takes time to sign autographs and take pictures with his fans, whom you can tell he respects with all his heart. So on the road we go again. Next stop is my home town, Portland, OR. I am ready to rock tomorrow night harder then ever, and to give you the final update on my part of the tour. Time to get some sleep, drink some water so I’m not hung over tomorrow, and be prepared for the drive home. Until tomorrow Strange Fans, and goodnight!